Perform the Registration (VIN registration) when replacing the ECM (See page ). Reset memory or initialization cannot be completed by only disconnecting and reconnecting the cable of the negative (-) battery terminal. Before using the Techstream, read the instruction manual. Prevent the Techstream cable from being caught on the pedals, shift lever or steering wheel when driving with the Techstream connected to the vehicle. When driving the vehicle for testing purposes using the Techstream, 2 persons are required. One is for driving the vehicle, and the other operates the Techstream. (a) Before performing work on electronic components, disconnect the cable from the negative (-) battery terminal to prevent damage to electrical system or electrical components. (b) Before disconnecting and reconnecting the battery cable, turn the ignition switch off and the headlight switch off. Then loosen the terminal nut completely. Do not damage the cable or terminal. (c) When the battery cable is disconnected, the clock and radio settings and stored DTCs are cleared. Therefore, before disconnecting the battery cable, make a note of them. When disconnecting and reconnecting the cable of the negative (-) battery terminal, the cowl top ventilator louver must also be removed and installed. Be sure to install the cowl top ventilator louver properly. If it is not installed properly, water may enter the engine compartment and cause malfunctions. 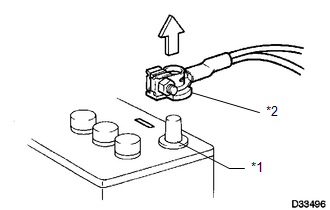 When the cable is disconnected from the negative (-) battery terminal, initialize the following system(s) after the cable is reconnected. The type of ignition switch used on this model differs according to the specifications of the vehicle.